We’d heard that St John was like no other island in the Caribbean, protected from development by the large national park that takes up the middle two thirds of the island…and by the fact that it was accessible only by ferry boat ride from St Thomas. We’d heard about the great snorkeling, the lush green hills, and the cute town of Cruz Bay where the ferry from St Thomas docks. What we found was so far beyond what we expected – a rough and beautiful island, with miles of pristine and undeveloped shoreline and vistas that look much as they must have when the first Europeans laid eyes on it in the 1500s. Our adventures began once we landed in St Thomas. From there we took a small shuttle bus for Ferry goers up over the mountains that overlook Charlotte Amalie harbor, then down to the other side of the island to Red Hook where the Ferry for St John leaves from. We boarded the ferry with minutes to spare, and enjoyed a calm and quick 30 minute ride to Cruz Bay. We were met at the docks by Wimco’s local representative Bob. He led us to our rental car, parked near the ferry dock, then we followed his car out to our villa. Our trip had come together at the last minute, so our first choice of renting a Wimco villa close to the village of Cruz Bay was out, everything was booked. 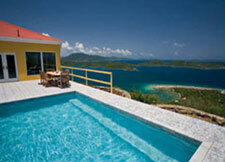 We ended up booking on of their villas on the eastern end of the island – in Coral Bay. To get there we drove out of town, then up into the National Park created when David Rockefeller donated the thousands of acres he had purchased when he developed his famous Rock Resort at Caneel Bay. We drove up and over a series of coastal hills, each crest revealing another stunning stretch of lush green undeveloped shoreline. We passed beach after beach with no buildings but a nearby parking lot and public restrooms – amazing. We exited the park and entered the eastern end of the island – Coral Bay. Aside from a smattering of private villas on the hillsides, and a few shops and restaurants along the waterfont, it too was largely undeveloped and in a native state. Our villa, the newly completed 2 bedroom villa MAS MSW was located high up on the strangely named Calabash Boom hill, 700 feet above sea level. It commanded a view straight down Sir Francis Drake Channel. 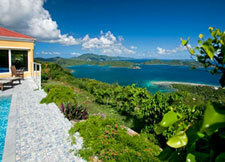 We could see all of Tortola, nearby Cooper and Peter islands, and distant Virgin Gorda. It was almost like being in a plane. The villa belonged to two famous musical sisters who live in New York, and they had left CDs of their music in the villa for guests to enjoy.